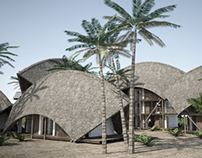 A dome is a natural strong design, it makes it possible to create a space with the minimum of material and is a basic method of construction, like the rafters on bearing walls. A method that has been used by humans since we built the first homes and is still used by indigenous people worldwide. 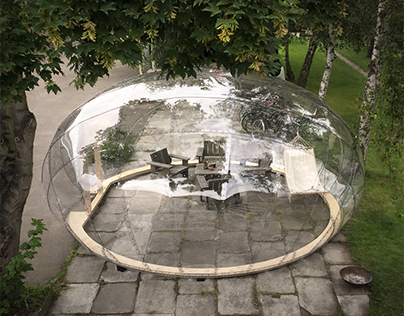 A geodesic dome is a modern dome structure, comprising of a pattern of standardized units based on a network of great circles on the surface of a sphere. 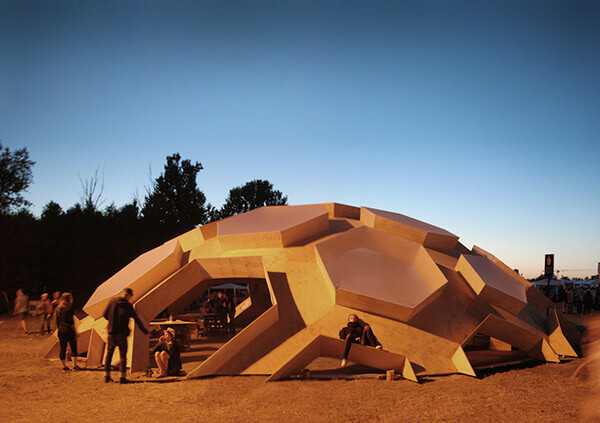 The geodesic dome was named by Buckminster Fuller in 1945, and is an geometrical optimized way of working with domes. 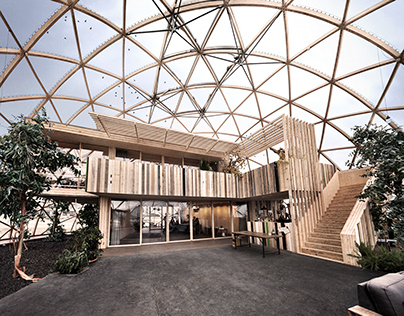 As said, the idea of ​​the dome is ancient and the modern principle is founded by Buckminster Fuller, who worked on the geometry that provides the simplest and strongest way to construct a dome. Fuller shared his vision and growing knowledge of geometry with all who were interested, and travelled in the sixties, visiting startup cultures and taught hippies to build cheap, effective and ecologically. 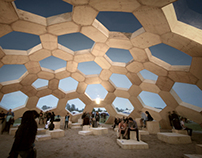 "TheDome" has since become an icon of hippie architecture. After Fuller's death, we discovered that the geometry he named is to be found in nature aswell. A family of carbon molecules have the exact molecular structure as we know from the geodesic dome. The molecule c60 was named after Fuller and the molecular family we know today as Bucky Balls. 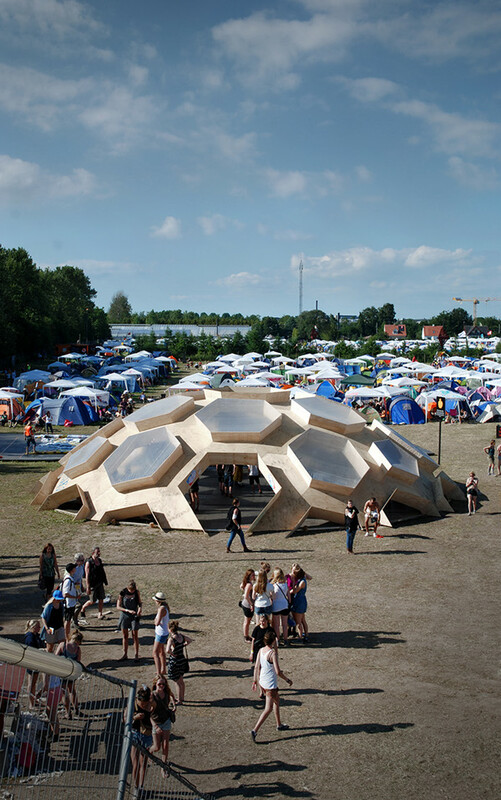 After having worked with Domes for years to uncover the spacious and functional capabilities, that can be created by knowing the principles behind it, I have long wanted to build a dome at the Roskilde Festival. 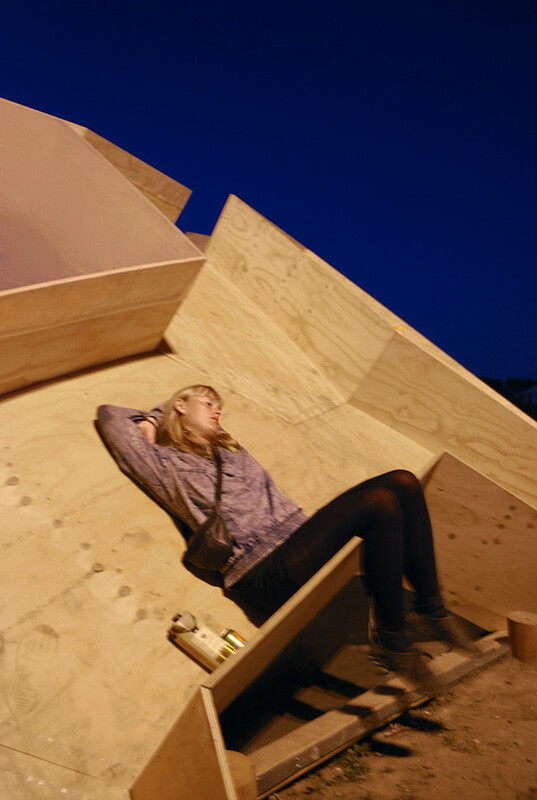 I've been a volunteer at Roskilde in several years and have painted several paintings for the stages and squares, and this year I thought I´d draw a domethat was built of the plywood panels that different artists had painted the years before. The plan was that the sheets should not be cut so they could be handed back afterwards, and this motivation that created the design method, ended up in the Plywood Dome. 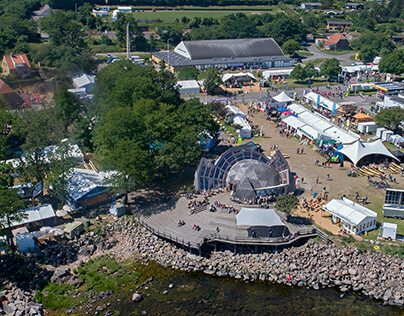 When Roskilde received my proposal I got an enthusiastic feedback; if I could build it four times as large and waterproof? The answer was no at first, but after a week of sketching I managed to draw a new dome that could accommodate their wishes. The project got its design trough primarily having to cover as much area as possible with as few resources as possible, since its primary function was as a hangar for a hot air balloon built by Aero Solar. 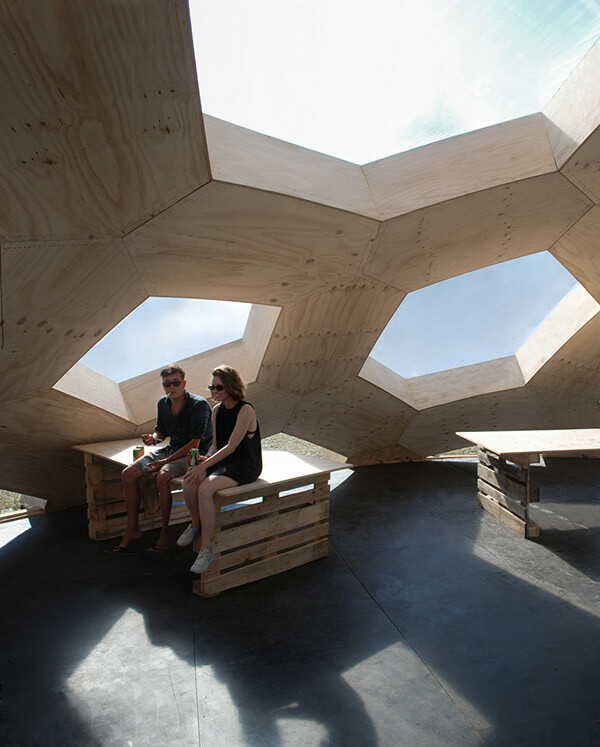 Plywood continued as the chosen material because it is strong and cheap and has become synonymous with temporary architecture at roskilde. 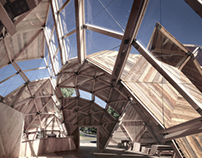 Dome is designed with intent to be temporary and reuseable. 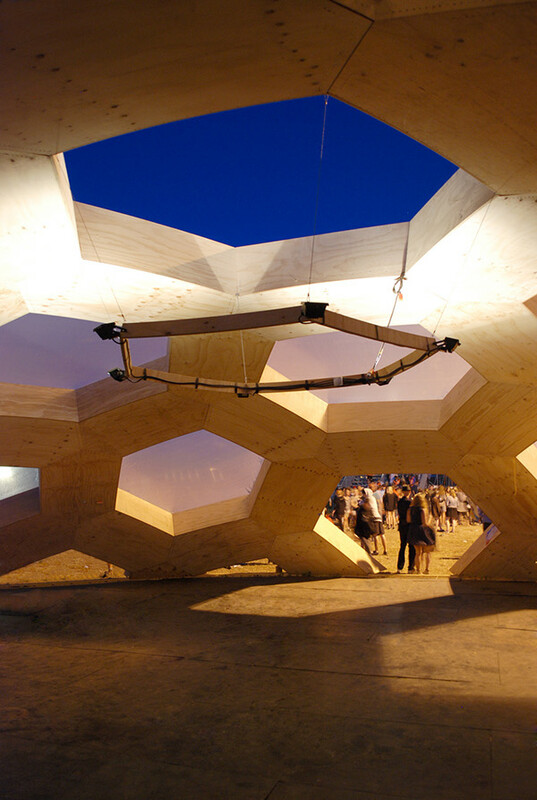 It is assembled by, and can be disassembled into modules that can be handled by two men and stacked on pallets for removal and storage. Stringers that sits perpendicular to the spheres surface makes it possible to attach membranes as drum skins and form trenches for drainage of the surface. 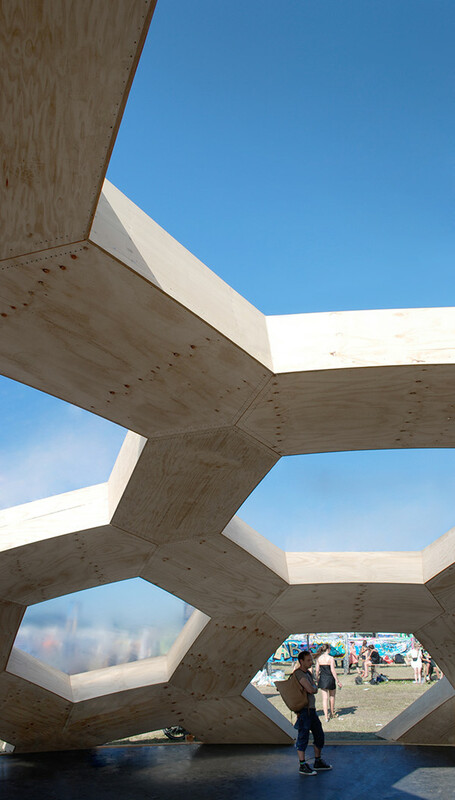 The dimensions of the modules is designed so that one in the future could produce more modules and make the dome approaching a hemisphere. 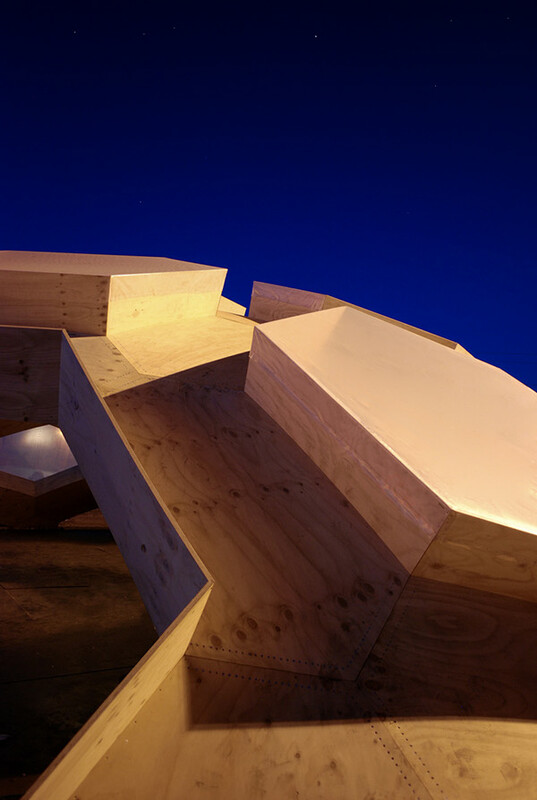 The Plywood Dome has the geometry that exists in a C240 ​​molecule, that is a frequency more subdivided than C60. It has 240 nodes in the full sphere where C60 like a soccer ball has 60. 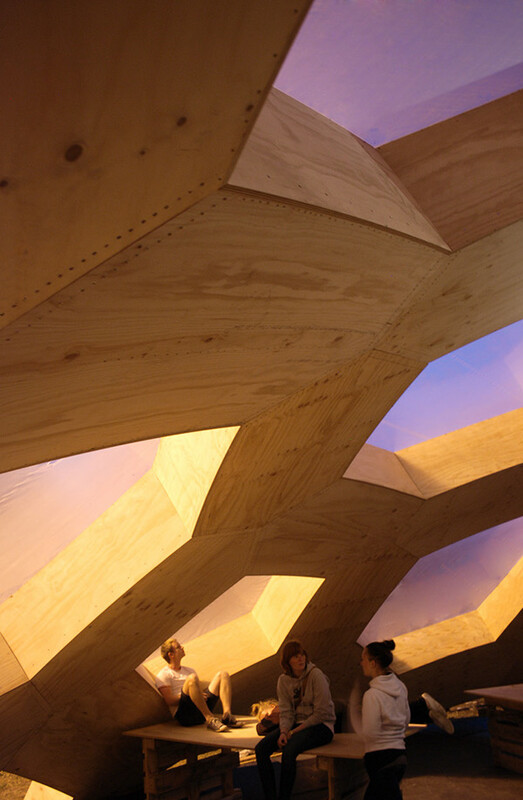 The Dome at Roskilde Festival this year had a novelty value because it is constructed entirely of plywood. This could be done by cutting the sheets to take advantage of their elasticity over the nodes and therefore avoid a complicated joint. 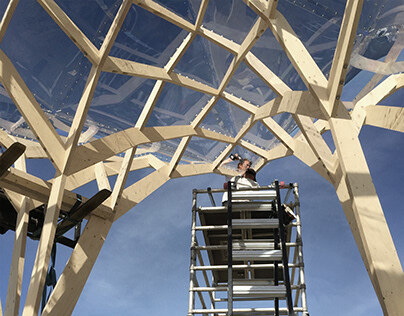 Which is made possible by having a 3D-model of the Dome and using a CNC milling machine to cut all the curved cuts that dictates the curvature of the sheets. The Dome had a diameter of 18m, was 4m high and was covering an area of ​​230 m2, 150m2 of which has standing height. 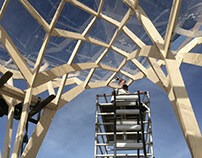 It took 250 sheets of plywood, 14000 screws and 150m2 greenhouse film. It can be extended to a full height of 11.5 meters, a diameter of 22m and an effective surface area of ​​400m2. Cost Approx: 70.000,- dkr / 9.413,- euro in material use. Dome of Visions 3.0 An experiment continued.